Most of the time some employees of the company get confused about their payment method and priorities and because of that, there is a possibility that the employee may confront the employers in a negative manner. When it comes to the payment system of the company, the employer needs to realize that paying what the employees have really earned is what they deserve, being the employer’s first and foremost priority. What is Time Rate or Time Wage System? Time rate or time wage system is one of the payment systems or wage measuring method which companies usually adopts when paying an employee. This wage measuring system is one of the essential features of any business. The company needs to look into the matters of the wage or salary rates, which should be given the employees of the company. While calculating the total amount of salary whether it is hourly, weekly or monthly, the employer needs to be aware of the attendance list of the employee. Here the employer needs to register every single information about the employee working hours. And at the time of salary calculation, the employer will consider those total working hours or time spent on the work of the particular employee. Therefore, the total amount of time spent on the given work will help the employer while making the salary of their employees. One of the important constraints that need to be considered while calculating the actual total salary of the employee, the employer must fix a fixed rate per unit of work. In this fixed rate per unit of work, the employer decides a fixed rate or price for the employee for the work he/she can deliver. Most commonly this kind of payment is called as wages and it is necessary to fix a certain amount for the work which an employee delivers within a specified period of time. The total output of the work is nothing but the total output of work delivered by the employee at the end of a specific period of time. While calculating the total salary or wage amount of the employee, the employer needs to look into the work which has been delivered by the employees. This total output will help the employee to consider the employee’s working ability and the quality of the work delivered by the employee. While calculating the wages of the employees the company need to keep the accurate track of all the employee number of production unit per day. Because this number of production units help to know the actual quality of the production of each and every employee. This helps to calculate the final total wage for that employee as per their quality of production units. This time rate system calculation is based on the working hours of the employee, that is the amount of time spent on the work along with the amount of work delivered within the specific period of time. Formula: Wages= Total hours worked X Wages rate per hour. These examples will provide a clear picture of these time rate systems. These time rate systems provide an accurate calculation of the wages of the employees. And it helps the employer of the company to keep track of their salary expenses as well. An employee works for Rs. 20 an hour and he spends a total of around 400 hrs in a month of 30 days at work. What would be his salary? Calculation under time rate system. Wages= Total hours worked X Wages rate per hour. Wages = 400*20 = 8000. Therefore, the employee receives a salary of 8000/- on a monthly basis. Very popular and easy form of payment. The work may get delayed depending upon the industry you are working for. When employees are freshers and are in training period for the respected job. Quality work is given more importance when compared to quantity work. Delays and risks of accidents are high and are out of control. There are several advantages and disadvantages of the time rate systems, and these advantages and disadvantages create differentiation for the purpose of the company benefits. The calculation and nature of the time rate system are very easy and simple to understand. It is one of the methods that can be understood by all the employers of the company. Its measurement and the calculation of this wage system provide the actual picture about the overall time rate system. Therefore, as it is mentioned earlier, it is easy and simple to understand and formulate in the company. This time rate system is very easy to access and that is because of its brief and clear detailed information. The details collected and maintained through this time rate system are very economical. In other words, it is one of the simple methods of understanding the total wages of the employees of the company. It makes records maintenance, affordable and clear. Therefore, it is one of the economic methods of calculating wages under time rate systems. As per the information provided by different sources of the production unit, the company performs better with these time rate systems. Eventually, the production quality will increase and the employer monitors all the production units without any mistakes. Therefore, because of this time rate system, the quality of production gets improved and it favours the overall development of the company. Even when it comes to a salary expense calculation, the company earns better profits because of its fixed rate of price. The time rate systems incorporate fixed wage systems because of which the company using it confirms a fixed rate of price per day. And this fixed rate per price helps to increase the profits of the company as its only a small amount of profit returns. Because of the time rate system, the employees of the company may feel equal within themselves. Most of the time several companies face a certain kind of union problems and if the company incorporates these time rate system policy, then the possibility of inequality issue will be considerably less among the employees of the company. Therefore, all the employees of the company experience equality among them. As per the formulation of this time rate system, the actual focus of this time rate system is on the part of the production where the employee works according to the specific number of time and production. Most importantly the work delivered by the employees will be based on their total daily production output. And it is obvious that it completely ignores the efficiency of its employees, because of which deserving employee feels unappreciated for their work. As explained above, the company works according to the specific production rate and it totally ignores the efficiency of its employees and because of that the employees of the company decide to leave the company. This is one of the disadvantages of this time rate system. Therefore, the company suffers loss of their skilled workers because of the time rate system methods of wage calculations. The workers and the employees of the company eventually understand that the company expects a certain level of production from them not the quality of work from them. This kind of ignorance creates inefficiency among the employees of the company. Therefore, all the employees of the company decide to work as per their specific production expectation and they try to not bring efficiency in their work because their efficiency will not reward them for their excellent work delivery. Most of the time the company incorporates some kind of rules and regulations in the company without consulting their employees of the company. And when it comes to the wage system and salary system, then the employees of the company will definitely have some conflicts of thinking. This conflict of thinking creates a communication difference between the employees and the employers of the company which is not at all good for the company development. As the company prefers its employees to provide a specified number of productions and the employees of the company meet their daily production unit, then there is a possibility that the company might increase the production output. This increment in production output leads to the increment of cost of production. Therefore, this can affect the company effectively because of this time rate system of the wage calculations. When it comes to the cost of supervision the company may end up being in trouble because of these time rate systems. Therefore, the company needs to cut back its supervision cost so that they can regain the position of the company. And to make that happen, the company needs to cut back from the time rate systems so that they can reduce the cost of supervision eventually. And the bottom line is that all this information about different type of wage systems provide the overall knowledge about the actual working behaviour of the company. It provides accurate information about the company wage systems, especially when it comes to Time rate systems the company expects certain kind of benefits from its wage systems. 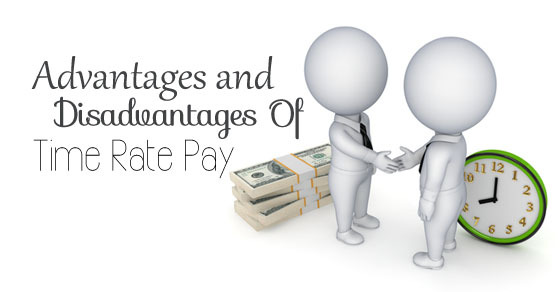 Therefore, it is one of the best options to choose a time rate wage system. And to know more about time rate system one needs to understand all the above-mentioned details.